I am attending the San Benito Health Foundation (SBHF) open house today in Hollister to celebrate the great work our migrant health centers do in their communities. I am so pleased to be joined by my parents, Alcario and Carmen Castellano. It is also a homecoming of sorts, as Hollister is the town my father grew up in. My dad was born in Artesia, New Mexico and his family headed west when he was nine years old to join other family members in the Central Valley. After spending time as a migrant worker in San Joaquin County, his family settled in Hollister in 1945 where they continued to work in the fields. My father picked cotton, apricots, prunes, tomatoes and garlic alongside his siblings and parents during his youth. Later, he joined the armed services and then worked in other industries including aerospace, ultimately retiring from Safeway in San Jose. He went on to win the lottery and established the Castellano Family Foundation which supports non-profits serving the Latino community of Santa Clara County. My dad has been very successful in his life due to his hard work and dedication to his family and community. I believe he was greatly influenced by the years he spent working on the farms of San Benito County. It’s not often that I get back to the area, but when I do, I can’t help but think of my father, his heritage, and his roots. My dad has told me stories about what a hard life it was back then for farmworkers. He recalls there were no social services for the farmworkers or their families whatsoever. There was no health care, no social support services, terrible housing and awful work conditions. While conditions are still very difficult for farmworkers, organizations such as the San Benito Health Foundation have brought very critical health care services to these communities. I am extremely honored to represent migrant health centers in California, as they have a tremendous positive impact on the lives of agricultural workers throughout the state. The open house at SBHF, part of a weeklong celebration of National Health Center Week, highlighted the important work our health centers do in the communities they serve. 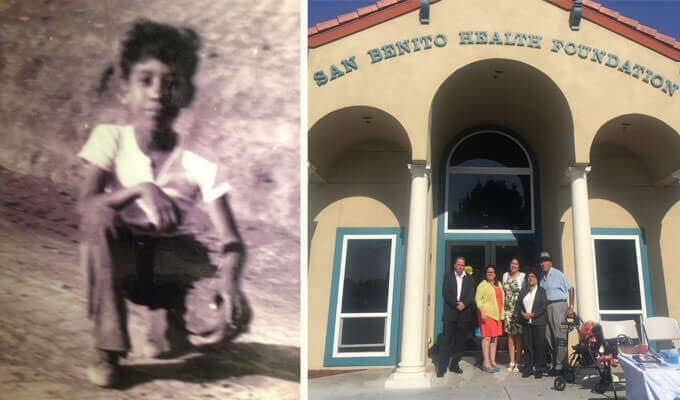 This event in particular celebrated the work of San Benito Health Foundation as a migrant health center – a vital part of our agricultural system in the state. In California, there are 340 migrant health center sites providing care the state’s migrant agricultural population, many of whom are undocumented immigrants. In fact, as many as 38 percent of the 2.6 million undocumented residents of California work in agriculture. Migrant health centers play a vital role in agricultural workers’ health since these workers experience higher incidences of work-related injuries as well as respiratory problems, musculoskeletal ailments, eye problems, hypertension, diabetes, and pesticide-related illnesses. The state’s recent drought has only exacerbated these health issues. Combined with low wages and limited time off, these workers endure tremendous hardship. Community health centers provide care to anyone in the communities they serve – no matter their immigration or insurance status. They were born out of a need to provide primary and preventative care to our underserved populations, a mission they are committed to and uphold each and every day. In California, our community health centers serve nearly 500,000 migrant workers and their families each year. Migrant health centers, including SBHF, coordinate care for agricultural workers and their families, who often migrate throughout California as they follow the growing season and help cultivate crops nearly year-round. These migrant health centers understand the challenges of frequent moves and adapt to provide the preventative and primary health care these families need. The centers also provide dental, pharmacy, behavioral health, outreach, and support services specifically tailored to these migrant communities. Without our migrant health centers, the health of our agricultural community would worsen until injuries and illnesses became so severe that they would require the costly services of an emergency department. Agriculture continues to be one of California’s largest economic drivers. According to the California Department of Farm and Agriculture, more than a third of the country’s vegetables and two-thirds of the country’s fruits and nuts were grown and harvested here. Given the vital role agriculture plays in our state’s economy, the health of agricultural workers is critical. Our migrant health center program is an important investment, both in the sustainability of our state’s economy and our nation’s food supply. It keeps patients healthy and healthcare costs down by treating illnesses and injuries early, before they become debilitating, thus preventing costly emergency room care. Delivering high quality, affordable health care to California’s agricultural workers benefits all Californians by reducing healthcare costs and improving health outcomes. As the President and CEO of the California Primary Care Association, and as the daughter of a former farmworker who spent his youth on the fields of San Benito county, it was such a pleasure to be a part of the San Benito Health Foundation celebration today, especially with my father by my side. It was an opportunity to pay tribute to the health center, its leadership, its patient population, and all farmworkers who are making a tremendous contribution to our great state. And, it was an opportunity to honor and appreciate my dad and his example of what can be accomplished when you don’t forget where you came from.